I passed on letting my husband buy me a Kindle for Christmas, thinking I'd rather ponder it further and then maybe get one for my birthday, which is still a few months away. In the meantime, I decided to download "Kindle for PC." 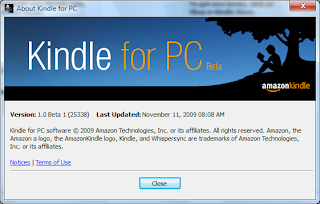 If you don't know about "Kindle for PC," it's an application you can download for FREE from Amazon. It allows you to read and store Kindle books, just like you would with a Kindle, but on your computer. It does nothing to the screen, of course, or the portability of your PC, which are the big selling points of the Kindle. So, if you don't want to be tied to sitting in your desk chair in front of your desk-top PC, it may not do you much good. Also, while laptops are portable, they're still much bigger than Kindles. The Kindle allows you to hold it like a book, and a laptop, no matter how wireless, will not. Also, the screen. Kindle has that great book-page looking screen that is easier on your eyes than a computer screen. So, if the Kindle is so wonderful, why am I not getting one? Well, first, I have a netbook. So the disadvantages of the desktop and laptop don't really apply completely. I can sit on the couch, or a lounge chair, and prop the netbook on my knees. It weighs almost nothing, and I just click with my mouse when I want to turn the page. The screen is still a computer screen, but the HP mini I have has such great clarity it doesn't bother me. My other reasons have to do with cost. The Kindle is expensive, but that's not really what I mean. I read a lot. And spending $9.99 every time I want to read something will add up FAST. I use the library a lot. If I love a book, I'll buy it to keep forever, and in that case I want print. I refuse to spend ten bucks on an ebook, fall madly in love with it, then turn around and spend the money on the print version. So, I'm stuck being mad that the money is gone and I don't have the "book." BUT, there are books I want very much to read and the library doesn't have copies. With the Kindle for PC, I can still get the book and often cheaper as an ebook. And if I know ahead of time a book is probably going to be a one-time read, then it's totally worth it. Or maybe the book is only available in electronic format and I just don't want to miss out. From what I understand, too, if I ever do get a Kindle, the books I have saved on my "Kindle for PC" will be accessible through it as well. So, it's been a great way to try it out without the initial investment. I didn't write this post to try and convince anyone for or against Kindles or ebooks. I think there is room for both, and I like having options. Mainly, I just wanted to express my recent ponderings, and to let everyone I can know about the "Kindle for PC" because several people I've mentioned it to have bugged their eyes and said, "What? I've never heard of that! And it's free????" What a great way to see if a Kindle will even be something I want! I have my laptop w/ me all the time so it will be a good test to see how I do actually reading a book online. Kat, have you ever been on half.com? There are many, many used books available for as little as 75 cents, and usually shipping is about $3.49. I'm always in pursuit of some obscure book, so for me, it's a great way to get books that the library doesn't have, although of course not new ones. Never heard of half.com, but I've bought gobs of used books through Amazon, and even new ones for just a couple of dollars plus shipping. And I always hit the bargain section of the bookstores first. I think the Kindle looks really cool... but I don't think I could justify buying one. Also, I like the feel of pages between my fingers and having the freedom to know how far I've got left to read at a glance. The smell of a new book would probably be too much for me to give up. And what would I do with all my nifty bookmarks? Thanks for the tip about the PC download, anyway. You're right, there's some great titles out there that you can't find in print anymore but are ready to read on Kindle.